Thank you for considering Allentown Professional Locksmith Service for your locksmith needs. We look forward to serving you. If you read all the way down here we would like to let you know that we appreciate you taking the time to read about our company. Once again, thank you for visiting our website of locksmith services in Allentown, Pennsylvania! Allentown’s Locksmith Services are important to all, whether automotive owners, residents, and business owners. However, the main issue lies in finding the right locksmith company in the city. Do not fall prey to rogue locksmiths with a luxury vans because all they want is your big money. For any kind of locksmith service in Allentown PA, contact us for emergency and mobile locksmith services. Our company have a good reputation in the Lehigh Valley, Pennsylvania. We offer long-lasting solutions to or community in Allentown. Our emergency mobile locksmith is your best choice for fast locksmith services in Allentown. When you call us, the owner of our company, answering your call and taking care of your job. We are making sure that you’ll get the best and the fastest customer service to solve your locksmith needs. Our locksmiths makes car keys and unlocking car doors, without damaging your vehicle, of course. Regarding to your residential locksmith needs, we have a wide range of services. We repair and changing locks, re-keying existing locks on your doors, and a variety of other specialties. Our vans are tricked out with the latest and greatest equipment giving us the ability to perform our services at your location. Your Allentown Professional Locksmiths here are the leading locksmith service providers in the city of Allentown and Metropolitan area. Our locksmiths are very experienced, and highly trained. They are equipped with modern tools and techniques to ensure that you get the best result from us. We never compromise with the quality, and this is the reason why we have built a strong customer base, till date. You should hire us at least once to get an idea of how we can help you. We’re always on call, ready anytime you need us most! Our locksmith service in Allentown is your best choice for fast locksmith services. We are fast, and as we show time and time again, we are local leaders in providing lock and key solution. The reason is that we can provide all type of lock and key services, 24 hours a day, within 20 minutes of your first call. Our locksmith specializes in custom security solutions for home or office, and can design a protection system that will be reliable for years. We are is committed to providing superior and personalized service that delivers outstanding results and long-lasting relationship with our customers. When you call us, we are quick to answer the phone, and make sure you get all the information you need. When we offer locksmith services, we always stick to customer service and quality; this is something that we guarantee in every service. If we install a lock on your door, it will operate for a long time without any problem. And if we installed a defective lock, we will replace it with no charge. You can watch us working on your locks, and enjoy the harmony of our labor. Protect Your Property – Call Us Now! Unless you try our services, you will not get an idea of what we have to offer. We offer quality services at affordable price, as well as courtesy. And this is something you won’t get from any other locksmith in Allentown. There are lots of advanced services that we offer to our Allentown’s community. So if you are looking for customized locksmith service, we’ll be happy to work for your specific need. You never know who may come into your neighborhood. Even in the safest neighborhood of Allentown, many people pass through, every day. For this reason, it’s important than ever for you to make sure that your residence and place of business is fully secured and protected from unwanted visitors. The level of insecurity in Allentown and all over the world has drastically increased. For example, in some cases people got robbed. In other cases women got raped while stranded at night after coming from a club. This is very unfortunate and that is the reason why we make it our mission to protect you and your property when you need us. And as faster is better. We care for our Lehigh Valley local community. That’s why we provide 24-7 mobile locksmith services. Whether you’re in Allentown, Bethlehem, or Easton PA, we can help. And whether you need emergency service or you would like to schedule service by appointment, we can help too. We care because we look for a long term condition with our Allentown community. One major principle of customer service is one of the key aspects that will affect any small business. We value our customers and treat them with respect and courtesy, there’s no other way. Your satisfaction is 100% guaranteed, and our first priority. Respecting you means we’re respecting your business. We gain our benefit when you refer us to your friends and family. Our emergency locksmith service is just a phone call away at (484) 275-0028. Please call us, as soon as possible, so we can provide you with fast emergency locksmith service. We provide emergency automotive, residential, and commercial locksmith services. The advantages of selecting us as your locksmith company include; 24/7 availability. short waiting time, and reliabile locksmith service. Our prompt response is a derivative of speed. We know that customers want it – you want our service – fast. Most of the customers don’t want to wait, therefore, we will do our best to be there quick as we can. You get our prompt response from your first call until the job is over, and you back to your day. We will be there with you within 20 minutes, and we answer to the questions raised over the phone, or on site. Not just speedy locksmith service, but efficiency, too. 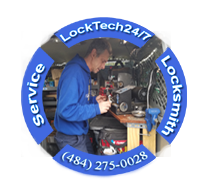 LockTech24/7 is a full line of mobile locksmith services for automotive, commercial and residential client. We pride ourselves in being experts on the locksmith industry, knowing all principles to each and every job. This means that at the heart of our business, we means to help customers down the road. When you’re calling us, you may expect us to do whatever is required by you. We provide a wide range of services in and around the locksmith industry. Our locksmiths are highly trained and extremely skilled to handle any lock and key problem in Allentown, PA.
That coupled with the excellent workmanship put into the product, that will guarantee us future business and a great reputation all around the valley. Our friendly staff will be happy to assist you, call us to experience outstanding locksmith service as well as to get the finest in security and locksmith results. Please call us or send us email for estimate. When a client hires a locksmith company to perform job in his property, that company is legally responsible for completing all of that work safely. This locksmith company may hire different technician, could be handyman. The subcontractor is liable to the general contractor, not the client. When you hire LockTech24/7, our house technicians, performs the job on your property. We also don’t use a dispatch or a call center, and we don’t hire sub contractors in your area. All the calls arrive to our mobile phone only, and our locksmith perform the job on site. If you really want to get the most locksmith service for your money, you have to look beyond lockout services. Spending more for security proven to hold its value well, and can save you thousands in the long run, concerning buying locks for a great deal online. LockTech24/7 guarantees to keep low prices, while providing a good quality of security hardware and locksmith services. You also get 3 months guarantee for every security hardware you purchase from us. Please enter our discount page to print and claim your discount. Over the past years we have conducted over thousands of locksmith services to the Lehigh Valley, PA.
Our professionalism in the locksmith industry is absolutely proven and guaranteed. On this website, we demonstrate our job experience in breakdowns of services. And each breakdown illustrates the relative percentages in details. We have been serving a number of clients in regard to various job aspects. Our locksmith are very experienced and professional in every parameter. And our reputation is based on that.